Conflicts are a built-in part of any relationship. No two people, no matter how perfectly matched, will get along in perfect harmony at all times. One of the greatest accomplishments in my relationship with my husband is not that we never argue, but that we argue so well (which actually means that we’re good at resolving our conflicts). This was not the case earlier in our relationship, especially not when we were engaged; then if we went two days without a fight it was cause for celebration. We used to fight bad and dirty. Petty disagreements would spiral into all-out war. It wasn’t pretty, and there were times I wondered if we were going to make it. Sometimes in the midst of an argument it felt like we were speaking two totally different languages, completely unable to comprehend what the other was trying to say. 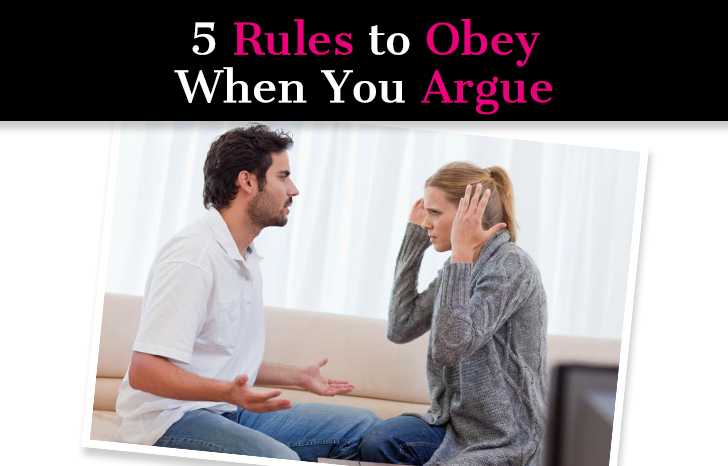 One of the most essential skills for a couple to master is learning how to argue well. We both had to do some work to get to a place where we could disagree peacefully, but ever since we got married we hardly ever argue. When we do, we’re able to resolve it in record time, and afterwards our relationship is usually even stronger than before. That’s the thing about conflict: when handled right, your relationship can strengthen. When done wrong, you each can start holding onto resentment and this can erode any happy, loving feelings within the relationship. So let’s talk about the right way to argue. First, it’s important to remember that arguments are a chance to grow, and that you and your partner are fighting for the same cause (to reach a place of love and harmony). He’s not your enemy and you’re not his, so above all else make sure to enter into the interaction from a place of unity so it’s each of you facing a conflict together, not each of your pitted against the other. Learning the distinction between responding and reacting will help your relationship enormously, and it’s also a very valuable life skill. When you respond, you are in control; you get to weigh your options and determine how you feel and how you would like to handle the situation. You don’t blame the other person for “making” you feel a particular way because you are in the drivers seat. When you react, they have complete control. You may say things you don’t mean, feel things you don’t want to feel. You go on instinct and may regret how you reacted. Reacting rarely takes things in a positive direction. Your knee-jerk reaction may be anger and indignation, or you may try to get back at the other person. Learning to respond instead of react sounds great in theory, but it can be really difficult in practice, especially when things are heated. You are really going to have to gain control of your mind to do this right. Just remind yourself that you get to choose how to respond to what’s happening; you don’t need to be controlled by your immediate reactions, which may only be manifestations of anger in the moment, anger that will soon dissipate. When you cave into these fleeting emotions, the conflict will only continue to escalate. I don’t expect you or anyone to stop having negative thoughts. Even after years of practice, I can’t do that and there’s no sense in beating yourself up over there. What any person can do is choose not to feed into the negativity. Even if you have a negative thought or negative initial reaction, just accept that it happens and make a solemn decision to not feed into it. When you can do that, then rest of the good habits will take hold and conflict patterns will dissolve. Take The Quiz: Are You In A Toxic Relationship? This is part of learning to respond instead of react. If things start to get really heated, tell your partner that now just isn’t a good time to talk about whatever the issue is and you’d like to discuss it later. In the meantime, you should take a walk, go to the gym, or just go someplace where you can be by yourself to let things settle down and gain some more clarity and perspective. In moments of anger we all kind of turn into two-year-olds throwing a tantrum. We can’t see beyond our own pain and anguish in that moment. A toddler can be perfectly happy one minute, laughing and giggling and everything is great, but then something happens and it’s like the whole world is ending. All they can see is the pain of that moment and the happiness from two minutes before that ceased to exist. In a heated exchange, you might totally forget that this person in front of you is someone you love, someone you’re sharing a life with, someone you admire. All you see is that he’s being stubborn or difficult and making your life hard, and all the good within him disappears. Maybe he is being a huge jerk and maybe he does deserve your wrath, but conversations had in moments of anger or extreme emotion rarely go in a positive direction. Instead, things typically escalate and worsen. Like I said earlier, you’re on the same team, and the goal is to get along and re-establish that connection you share. As soon as you step away from a situation, you might see things in a whole new light; something that seemed like the end of the world a few minutes earlier might not be that big of a deal. The reason a lot of couples get into the cycle of endless arguing is because they don’t address the root of the problem. Instead they argue about trivial things instead of the real thing. One big complaint women have is that their guy doesn’t help out at all, and they have to do everything. They may have a fight over him not taking out the garbage or leaving dirty dishes in the sink, but they aren’t addressing the core issue. Maybe they’ll argue that not taking the garbage out will attract bugs and rodents (a valid argument!) but that isn’t the point. The point is the woman most likely feels taken for granted and maybe like her man doesn’t care for her. That’s what’s really going on. Whenever you have recurring arguments, or find yourself going at it over something that seems trivial, try to uncover what you’re really upset about. In a moment of anger, it’s tempting to jab your opponent between the ribs, but it isn’t helpful and will only make things worse! Try not to resort to name-calling, labeling, and attacking to get your point across. Also, stay away from overgeneralizations. (“You never do anything for me.” “You always leave things lying around.) No one ever always or never does something, and I’m sure anytime someone used an always or a never on you it was infuriating. Name-calling is also problematic. Yes, it may have been in a moment of anger, but once you say it you can’t unsay it, and you don’t know how it’s going to hit your partner and affect him. Instead of “You’re such a jerk,” you can say, “You were acting like a jerk.” Just that small little tweak makes a difference because people always get defensive when they are given a negative label. Even though your partner might be making you insane, remember that he isn’t all bad. If he were, you wouldn’t be with him (hopefully). He’s actually someone you like and love, and we should never intentionally try to hurt the people we care about. That’s destructive and can lead to a toxic relationship. So, I have been dating this guy for over a year now. We are fifteen years apart. I his junior. I am a mom of two and returning college student and I have a lot going on. We started out great mostly physical attraction, similar beliefs and values and felt we could talk about anything. Well I find out he is into Sadomasochism mildly but I don’t like. My family doesn’t like him that much and I have broken up with him a few times because whenever I need him emotionally he clams up and he appears to have no gentleness or compassion about him. I have asked him for what I need and he thinks I should toughen up but I need a shoulder to lean on sometimes and someone to tell me everything will be alright even if it wont. He cant seem to be that and I also think that will spill over and affect my children in the future if they need him. He has said on many occasions that no one would love me like him and be there for me because I have kids. Although I am told I am beautiful those things that he says affect my self esteem and sometimes I think he might be right. I don’t know if I should leave I admire his strength but not some of the attributes of his character. This is killing me and I am losing the joy in my favorite holiday season. Help please!! Hi Sabrina, I want you to know that I followed your advice very carefully before confronting my partner with his cheating. I also read another article on here about cheating, and how sometimes it isn’t about me, but about him and how he has some voids he needs to feel. So I approached him about it, and emphasised that I wasn’t mad, that I just wanted to understand him and perhaps we can both agree to a compromise. He was very honest about everything, I understand that he needs attention from someone other than me which will boost his self-esteem. So I allowed him to continue his ways as long as he doesn’t hide it from me and to be honest, also not to engage them in any sexual activity, even online. He agreed. However, after a day of this discussion, I still feel like I haven’t forgiven him yet. He hurt me really badly. And yet i’m the one compromising and understanding him greatly. He doesn’t treat me like a partner, rather like a pet who he doesn’t want to upset. So he constantly tries to make me happy but he never expresses what he wants from me. I’ve expressed this to him, and all he can say is “tell me what to do, I don’t know what to do to earn your trust. Just tell me what to do and I will do it, to make you happy.” This is very frustrating. Because it feels like I’m the only one trying to make this work. I feel like if I don’t initiate anything, the relationship will just die on its own. Should I leave him? We’ve been seeing each other for over a year. Please help! Thank you in advance.